Coach Johnson has coached women’s and men’s soccer at several levels over the past thirty years in Wisconsin. 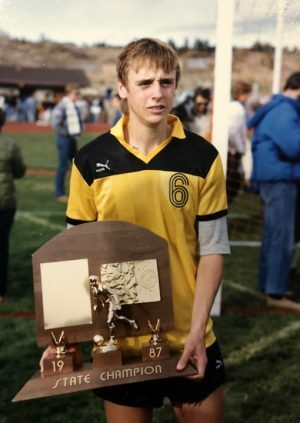 Born and raised in Lakewood, Colorado, Chad attended Green Mountain High School where the Rams boys soccer team won a Colorado High School State Championship. Coach Johnson was named Dr. Pepper, Colorado High School player of the year in 1988. Not only did Chad lead all Colorado High Schools in scoring but he also scored three goals in the State Championship game his Senior year. The Lakewood Hawks, Colorado Fury, Denver Kickers and the Lakewood Ballistics were the programs where Chad played his youth soccer. Between these select teams, Coach Johnson was able to play in Mexico several times and throughout the United States. At the age of fourteen Chad was selected to represent US Soccer on a twenty one day training / playing tour of Europe. Besides outdoor soccer experiences, Chads last Club Team, Colorado Fury, won two Mitre Indoor National Championships and finished second at a third tournament. 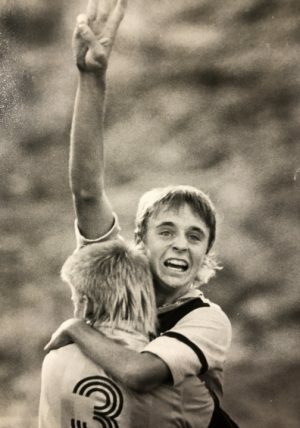 In 1988 Chad accepted an athletic scholarship to advance his soccer and academic career at the University of Wisconsin Green Bay. Coach Johnson played only three seasons after breaking his left leg his senior year, an injury that ended his soccer career. Before his injury Chad earned Team MVP honors, All Conference Selections, All Tournament Team at the Santa Clara Met Life Classic in California, and was selected Team Captain before his devastating injury. Chad also celebrated scoring the 1000th goal in program history which he scored against Cleveland State. During the off-season Chad played in the Wisconsin Major Soccer League for the Croatian Eagles in Milwaukee. He also traveled home over winter break where he played indoor soccer on a team made up of college players from the Denver, Colorado area. This team won the Mitre Colorado Indoor State Cup and went on to win the Mitre Men’s National Championship in Baltimore, Maryland. In 1991 Chad’s Senior year he was named Team Captain. Near the end of training camp and the night before the team was flying out to play in the UNLV Tournament, Chad and teammate got tangled up and Chad broke his left leg. The injury was severe enough that it ended his playing career. With the loss of the ability to play soccer at a high level, UWGB placed Chad as an Assistant Coach on their Women’s Soccer Team. 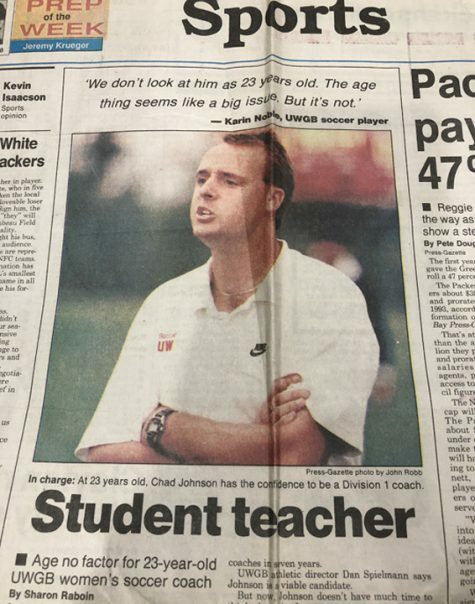 Shortly before the 1993 season started, some changes took place and Chad was named Head Coach for the UWGB Women’s Soccer Team. From 1993 to 1995 UWGB Women’s Soccer went 27-25-4 with Coach Johnson’s first season 1993 at 13-4-2 still recognized as the programs best record while competing in the NCAA. Coach Johnson resigned after three seasons to search for full time work. Coach Johnson also served as the Head Coach for the Saint Norbert D3 Men’s Soccer Team for four years and three years as the Saint Norbert Women’s Coach. Coach Johnson led the Green Knight Men to their first Conference Championship in fifteen years and a post season invite to the NCAA D3 National Tournament for the first time in program history. Coach Johnson was named Men’s Conference Coach of the Year and Women’s Conference Coach of the Year during his four years at SNC. 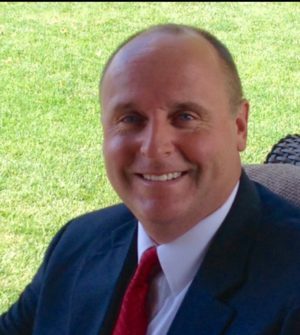 Coach Johnson resigned from both programs to start a full time career in medical sales. 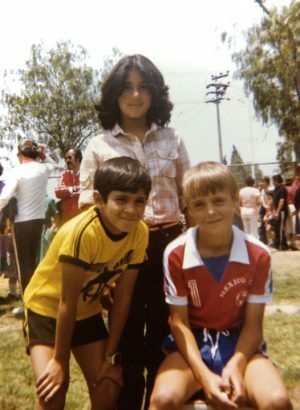 Chad has been a constant in Green Bay Area soccer youth soccer for years. He’s coached at multiple high schools and for several area youth clubs. His proudest moment in youth soccer occurred in 2016 when his U14 United Hurricane Girls State Team won the Wisconsin State Cup and earned the opportunity to represent Wisconsin at the Region 2 U14 Championships in Indianapolis. Coach Johnson is married to Tricia Simoens Johnson and they have three kids, Cade, McKenzie, Paige and a Puggle named Burton.